This is a spec house in Venice with a very interesting backstory: It hit the market last year for $1.988 million, but then dropped to $1.688 million before being taken of the market altogether. 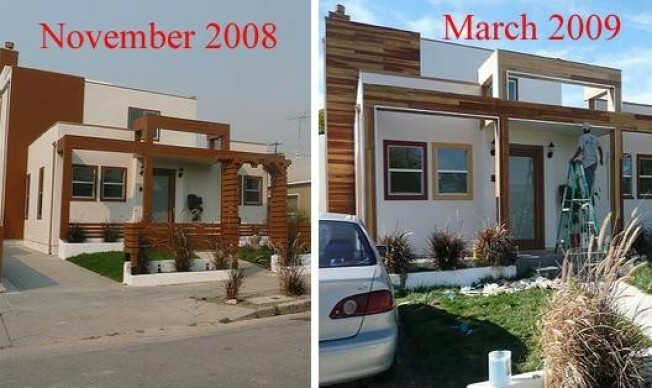 The developers purchased the home that was on the site (but didn't tear it down completely and incorporated the original home in the redesign). But here's the problem: The developers weren't happy with the finished result, so they hired back the architect, Ignacio Erazo of IGE Design in Norwalk (he was the original architect on the project, but says he left when the contractor started making changes that he felt uncomfortable with). After the jump is a list of all the things that Erazo tried to fix. We never saw the interior before it was finished, but friends who did see the house tell us how it looks now is a vast improvement. And considering the prime location in Venice, we imagine that the home will get a much better response now. ---Much of the brown-colored exterior paneling was taken down. The huge slab of wood (on the left) was removed, and flipped over—Erazo used the back of the wood. ---The gate was taken down. “The gate made the house feel too crowded,” says Erazo. ---Originally, there was a wall that faced visitors when the walked into the home, forcing them to walk to the left, around the wall and into the home. Erazo says the contractor cited “fung shui” when putting up the wall. It was removed. ---The closets had to be redone because the contractors put the closet rods only allowed six inches from the wall (they need to be 12 inches away). ---The contractors used the same brown-colored paneling for the trim around the walls in the bedrooms. That paneling was painted white. ---Another problem: The downstairs bedrooms and the hallway have different ceiling heights. Nothing was done to fix that. ---The kitchen was cut off by another row of cabinets (that faced the living room). Those were removed. Additionally, the cabinets and lighting fixtures were replaced. ----There was a large bench in front of the fireplace that made the space feel more crowded. It was removed. ---There was no outside deck. Instead, the contractor had put a three-foot brick tile pad outside the door. The architect added the larger deck, the walkway to the garage. Additionally, he plans to put into a pebbled stoned design in the grass around the walkway part. ----The gutter system still isn’t fixed—it needs to be put in at an angle to it could properly drain the water. During heavy storms, it would have dumped water onto the neighbor’s lawn. ----Railing on stairs not appropriate for style of home. Not changed. ----Upstairs, there was another strange wall put in. Before, the hallway wrapped around to the left, forcing homeowners to walk around and through a hallway to reach the bedroom. Erazo changed the layout, making the old hallway a closet and connecting the bedroom to the stairs via a small entryway. ---There are two showers. Originally, one of the showers was a sauna, but the plans were changed. --- Erazo took down the mirrors and added mirrors with medicine cabinets to store items. ---As for other future additions, Erazo said he is still looking to add an exterior deck in the front of the house.